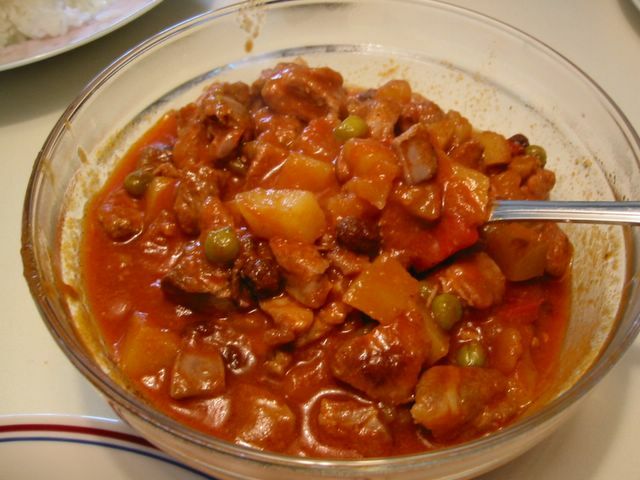 I haven't cooked menudo for a long time, actually it was years ago when I last did. This is all to do with pork liver which is a required ingredient here (if it doesn't have liver I don't consider it menudo). Pork liver in the UK really are stinky (most of the time). No matter how much I washed it before cooking, right after I stir it in the pot it starts to stink. So much so that more than half the time I have to throw away the whole lot. What a waste! I don't know why they stink here. In the Phils and in Hong Kong I never had this problem. Could it be the way pigs are raised here? Or the handling at the abbatoir? I really am clueless. Anyway, I had some chicken liver to use up and thought of using it in menudo. It was a great addition. The taste wasn't as strong as pork liver but it will do. This recipe is how menudo is cooked in my mother's family, rich and a bit sweetish with the addition of the cheese and raisins. They are actually optional but you should at least try it with them. Heat oil in a saucepan or pot. Saute garlic and onion in low-medium heat until onion is soft and translucent. Stir in pork, cook for a minute. Add soy sauce, stir and cook for another minute. Add the passata, bell pepper, salt and pepper to taste. Bring to boil and then bring down the heat to low. Simmer until pork is almost cooked - about 40 minutes. If it's drying up too much add hot water a little at a time. Mix in the liver, potatoes, and carrots (if using). Turn up heat and cook until potatoes are almost cooked about 5 minutes. Add peas and raisins, cook for 2-3 minutes or until peas and potatoes are thoroughly cooked. [Optional] Add cheese, stir and remove from heat. Serve warm.